Sara McConnell has photographed over 2000 sessions, and worked with over 1500 families. Here's just what some of them have to say! Read over 100 client testimonials on Facebook. Read 30+ additional client testimonials on Google Reviews. Thank you Sara for capturing some of the most precious moments in our family's life! You have shared my pregnancy, both of our babies and family shots in between. We love all the pictures and have many printed on canvases around our house, but the best part is your wonderful personality, you put us all at ease and make sure our pictures are really us. We know we will be calling you again soon! The forecast was calling for 90% rain all afternoon and I was on constant radar watch, wondering if our Imagination Session would be cancelled. We got ready and drove to the session location convinced that it would start pouring as we got there but once again, Sara worked her magic! The rain held off and we entered her magical world. She even managed to get some smiles from our oldest - if that isn't proof that Sara has magical skills, I don't know what is! Sara displays amazing professionalism and her finished product is always decadent! From the ease of booking a session, to Sara's warm personality, her ability to keep my toddler happy and excited during the shoot, how efficient and fast we received our proofs and the quality of the photographs was a step beyond any photography service we have ever received. 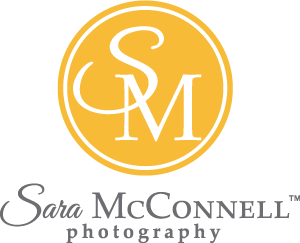 I highly recommend Sara McConnell photography to all of my clients, friends and family. When I met Sara in a local running group, we spent our 10km running together discussing many things, photography being a frequent topic. Her passion for photography shone through our breathless attempts at conversation (although we got much better at conversing and running as we progressed through our clinic!) I was so intrigued by her scope of photography, that I immediately went home and looked her up. I decided then and there, that as soon as I was expecting, she would be my go-to photographer. My maternity session was in December — and likely the coldest December day to be outside, but Sara embraced the cold and the opportunity to shoot some unique Winter maternity images. The careful thought and consideration for location, lighting, positioning and more, produced beautiful photos that often remind me of the excitement for the journey I was about to take on as a new mom. Our newborn session saw another creative photo request that Sara excitedly took on - firefighting gear. Her patience, determination and impressive baby handling skills landed some of the most amazing newborn pictures that I still receive compliments on. The newborn photos in the fire helmet and boots were so fun to do the first time, that re-creating them for our daughter's first birthday seemed like a no-brainer. It is Sara's willingness to take a step outside of the box and do things a little differently that has us coming back for me. We later did an extended family photo session with Sara that saw yet another challenge - rain and three little ones on the verge of melting down. Relying on her own skills as a mother, Sara was able to deter the impending melt-downs with toys, songs and goofiness that would put a smile on anyone's face! And when our dog decided that it was her time to shine in the middle of our fall session, Sara laughed along with us and captured some funny images that still make me shake my head and say "that dog!" as I walk by them in our living room. A Winter maternity session in frigid temperatures, fitting a baby in firefighting boots, a Spring family session in the rain with children melting down, a dog frolicking madly through the leaves in the fall - we have thrown many an obstacle at Sara and she has embraced each and every one of them as a fun challenge, an opportunity to not just let the subject's shine, but her genuine talent too! We were lucky enough to stumble upon Sara's amazing work when she posted in a local Facebook group about breastfeeding mini sessions she was offering. When my little one and I arrived at her home studio for our session I was impressed by how warm and friendly Sara was. She made us feel very comfortable and the photos turned our beautifully. I am constantly amazed by the number of fantastic shots that Sara can capture in as little as 15 minutes, how quickly she is able to provide the final edited images with us and how easily she can make my toddler smile. If her portfolio alone does not convince you of her talent, watching her interact with your child sure will. Sara McConnell...just her name brings a smile to my face. Sara first captured the beginning of our new family in our maternity session in early 2013. After 1-1/2 years she has continued to provide us with still shots of so many heartwarming and emotional magical moments. Sara is always looking for new ideas and themes and has an endless supply of props and backdrops to make each of her sessions unique. She definitely knows how to multi-task - while working behind her lens, she will often times double as a costume consultant, hair stylist and comedian! We are the lucky parents of two amazing and beautiful girls. Sara McConnell has a remarkable ability to bring out the smiles from all children in just a few minutes. This picture was taken on the first year anniversary of our daughter and she captured in this one picture their true beauty and happiness. We are so grateful to be able to keep this memorable moment and see it on a daily basis on our wall. Thank you, Sara! Sara has taken our family photos three times now. We love the fact that she takes the time to ensure that our children are comfortable so that she can take the perfect shot. She is very patient, caring and professional, and her pictures are always amazing. Thank you so much Sara! My husband and I had the pleasure of having Sara take newborn photos of my 8-day old daughter. At first, I was hesitant to have photos done since the thought of leaving the house with a newborn sounded overwhelming (i.e. the photo session would be the first time venturing outside the house and the photo session was scheduled to last for three hours) however, Sara made the experience so pleasant for everyone. Her studio is designed to allow for one to comfortably care for a newborn and Sara has the magic touch to take stunning and creative photos of newborns, all the while being so gentle with your baby. A picture might be worth a 1000 words, but Sara McConnell Photography is priceless. The memories, both in the form of the photos we've received and the painless ease of her photo shoots, are what set Sara apart from all others. She exceeds our expectations every time, managing to coax even the most reluctant baby (or husband) into heart-melting smiles and genuine family moments. "Thank you" hardly seems adequate. It is always a pleasure to work with Sara. Immediately upon arriving at our cake smash session, she made everyone feel at ease. Smiles came naturally and beautiful moments were captured. There are a lot of people who can photograph a moment. It takes a truly special photographer to help create that special moment. Thank you, Sara.